I’m going to summarise Scotland's seven cities here in just one page – just as an aid to your trip planning, if you are a first-time visitor. This is just an overview, with only enough honest opinion and hints to displease a few city tourism promoters. How long should I spend in Scotland’s cities? Ah, glad you asked that, read on…. Population: c. 465,000 - the second largest city in Scotland. Of all the cities in Scotland, this is the best looking. Scotland’s capital is almost glamorous, it’s certainly romantic and the word I’ve always used to describe it is ‘theatrical’. Edinburgh Castle - a view looking up from West Princes Street Gardens. The fine neo-classical facade of the Royal Scottish Academy, Edinburgh, moments from Princes Street. The Scott Monument spire and the Balmoral Hotel (right) are further back. The famous Edinburgh Military Tattoo. Major events such as the Edinburgh Military Tattoo attract huge numbers of visitors to the city. Book accommodation ahead, especially if visiting in the main Festival season. From a practical trip-planning point of view, you really should book Edinburgh in advance - especially anywhere near peak festival time – late July, August and into September. And as you can explore places like Fife, Glasgow, East Lothian, the Trossachs and so on from the city, you could easily spend, say, at least four nights on a first visit and still find lots to do. The martial spectacle of the Edinburgh Military Tattoo (pictured here) has made Scotland’s capital famous the world over. Sorry. Every so often I slip back into brochure-speak. Follow this link for some fascinating facts about Scotland, which includes Edinburgh. A list of Edinburgh must sees is also found in the Seven Day Tour of Scotland page. If you are visiting for the first time with only a couple of days on your schedule then here is a core list of must sees in Edinburgh. Wait, wait, there’s even more stuff on Edinburgh. There’s a good background and mini guide to the New Town of Edinburgh on that link. And here are some suggested tours from Edinburgh. And don't forget to check out Edinburgh hotels near the airport. Souvenirs of your visit? Cashmere and woollens are always popular, say, by Edinburgh Lambswool. (Examples on Amazon.) Edinburgh distilled gin is also an option. Right, got it. People Make Glasgow. OK. This is the largest of Scotland’s cities, with a population approaching the 600,000 mark. With reference to its industrial past, it is one of the cities in the British Isles that is sometimes described as ‘the Workshop of the Western World.’ In its post-industrial phase, it did a great job of re-inventing its own image from about the late 1980s onwards and now likes to link itself to words such as ‘stylish’, as in Glasgow is ‘Scotland with style’. 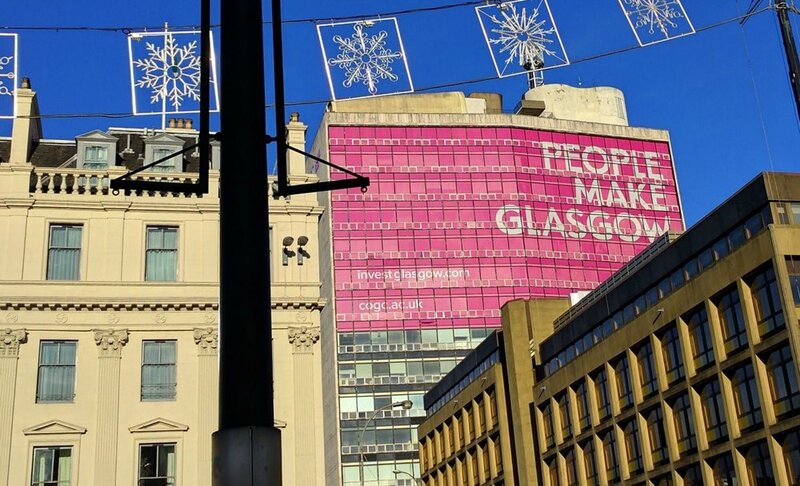 Way back in 2013, they changed their slogan, tag-line or whatever and continue to promote the city with the catch-phrase 'PEOPLE MAKE GLASGOW' – which isn’t bad at all (IMHO), though they rather ram it down your throat. It's everywhere, from street signs to office blocks. 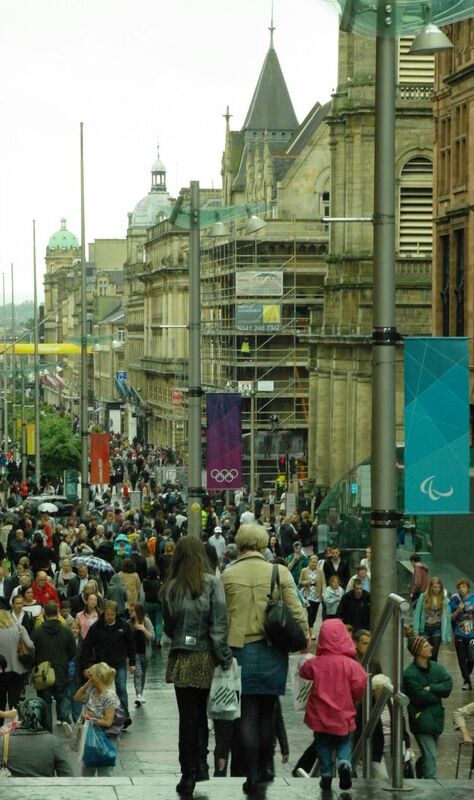 The other thing often said about Glasgow is that it offers the widest shopping choice of any of the cities in Scotland (sorry, Edinburgh) and certainly used to trumpet the fact that it was second only to London, England, in terms of the importance of retail to the local economy. There seems to be some uncertainty about that statistic – but it’s definitely a shoppers’ destination, not just for the usual High Street suspects but for a huge choice of exclusive outlets. For instance, the little picture here was taken in July 2012, on a wet midweek day when the Olympics, in London, England, were taking place – and London’s downtown retailers were all moaning about how quiet it was on the shopping streets. Well, not in Glasgow, it wasn't…..! And it's still as bustling today. And then when Christmas draws near, the good folk of Glasgow throng the streets. That's the other thing: it's pretty much an all year round destination - no surprises there. More on Glasgow below...oh, and check out hotels near Glasgow Airport. Or look here for a selection of Glasgow guidebooks. Also, check out a blog piece on the football sectarian rivalry in Glasgow. Glasgow also likes to trumpet its reputation for friendliness – all that ‘legendary friendliness of the Glasgow folk’ stuff. Linked to this friendly yet urbane image is its own belief in its ‘café society’. Like Edinburgh, there are plenty of cultural opportunities, especially Kelvingrove Art Gallery and Museum, one of the finest in the UK - pictured below - plus all the clubs and pubs you could ever want to visit. And I see I’ve just managed to write a paragraph on it without using the word ‘vibrant’ -another of its favourite descriptions of itself. If you want to visit, then you’ll need at least a couple of days to do all the museums and the shops alone. On the other hand, if you have a preference for quaint little towns or rugged scenery, then you could miss Glasgow altogether. Follow this link for a short list of facts about Glasgow. It takes you to the main facts about Scotland page. A list of Glasgow must sees can be found on the Seven Day Tour Scotland page. Actually, to be honest, I’m not sure if I even like Glasgow, though I remain open-minded, I hope. Population: c. 148,000 - putting it at no. 4 in the league of Scotland's cities by size. Personally, I find Dundee just as friendly as Glasgow. (I almost said ‘less menacing’.) Or is it just that I always find I fall into conversation with folk in shops when I go there? Like Glasgow, a big chunk of the old inner city has been ripped up and renewed, especially where the old jute mills once stood. Dundee, again, like Glasgow, went through a period of re-invention and came up with ‘City of Discovery’ – which is pretty clever, as the RRS Discovery, a polar research ship, is berthed on the waterfront as a symbol of the city’s heritage of, well, all kinds of stuff – but mostly the building of the tough ships used by the whalers of olden days. There’s a clutch of heritage-type attractions to visit, as well as a worthwhile family-focused science centre (Sensation) and a flagship arts centre. 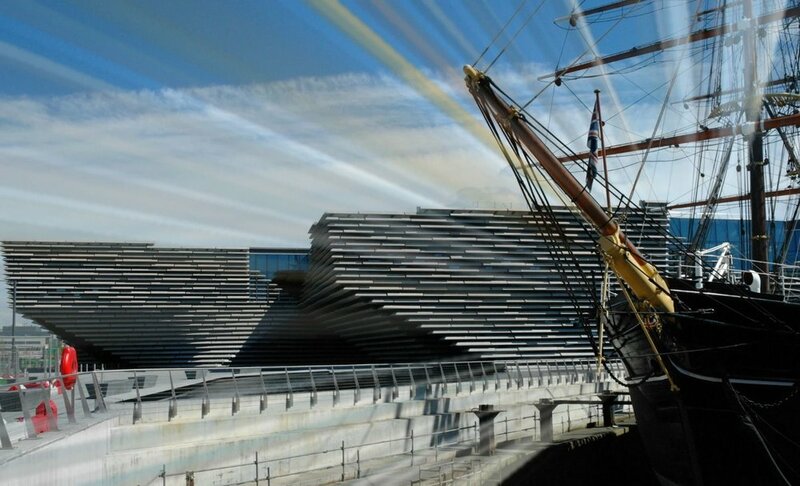 And, now arrived, is the V&A Museum of Design Dundee - an international centre of design for Scotland - the first ever design museum to be built in the UK outside London. It opened in September, 2018 and you can visit for free. Hurrah. Here's a suitably arty-smarty picture of the new V & A Dundee, Scotland's first museum of design. It will be the only V&A museum in the world outside London, England: an international centre for design, a place of inspiration, discovery and learning. (According to the press information.) The famous RRS Discovery, long after its Antarctic adventures, is, uhmm, parked nearby. And Dundee is a good base for exploring Fife and the Angus Glens. While not a ‘must see’, if you like the idea of cities in Scotland, then you could spend a couple of days here, as there’s a lot to visit round and about. Population: c. 197,000, making it the third-largest city in Scotland. This northern city wore the comfortable air of a large market town, until oil was found in the North Sea. (Trust me - I was there then!) Then it just got on with making money. It didn’t worry about its image or about re-inventing itself. If tourists wanted to visit then that was OK too, but they'd find the hotel prices steep - because of the oil business demand. Nothing much has changed, though the oil activity seems to have peaked and Aberdeen hasn't found things so easy. You can still hear gulls calling above the noise of the traffic on the main street (Union Street), as a reminder of its old maritime connections across the North Sea. However, as of 2018, there's no hiding the fact that Union Street is no longer the busy vibrant shopping area it used to be. It looks a bit run-down. The retail tide has ebbed away. These days, shoppers go to Union Square down by the harbour, an attractive modern mall which takes in the frontage of the city's main railway station and looks exactly like any other mall anywhere else in Scotland or beyond. Downtown, Aberdeen looks different from all other cities in Scotland because of the widespread use of grey granite. They (used to) fly in from Norway to shop here – itself a reminder that, had there been the will and the vision, it could have positioned itself as a North Sea rim city, flaunting its differences in accent and outlook – a vibrant northern community. But it never had to. It just got on with being Aberdeen. And that’s fine. Sure, it used to be called ‘the silver city with the golden sands' – a reference to the fact that it has, well, a very long promenade. For more on Aberdeen and its old role as Scotland's largest seaside resort, take a look at the priceless prose of the 1950 guidebook Aberdeen the Silver City with Golden Sands. But I can’t think why you would actually need to visit, if you only had a few days in Scotland. Sorry about that. I’m not putting you off, am I? If you are thinking about visiting Aberdeen – as a leisure visitor – then the above information is somewhat grumpily expanded in an Aberdeen blog post here. Population: c. 61,000 - so, of the seven places with designated city status in Scotland, it's bigger than Perth and Stirling. The Capital of the Highlands acquired its city status in 2000. As a natural route-centre, it’s always busy with visitors. In fact, it’s always busy - period - and consequently seems a very up-beat sort of place. Don’t expect quaint and picturesque – but do expect a wide accommodation and restaurant choice. Do visit the Inverness Art Gallery and Museum if you can - you will learn a lot about the Highlands - as well as how to wear the belted plaid or say some Gaelic phrases - and there is a also lovely cafe here - nice cakes and soup! You can enjoy an equally wide-ranging list of out-of-town options, from Loch Ness monster spotting to exploring Culloden Battlefield. Inverness viewed from the edge of Culloden Moor. All the rugged beauty of the western seaboard is only an hour or so away by road or rail. You could certainly spend a few days here – not because the place itself will make you go ‘wow!’ but, if you like larger places as a base, you won’t be able to avoid it if touring the north! We also have a 48 hours in Inverness page! And check out the hotels near Inverness Airport. Inverness - looking towards the city centre. This is the River Ness, flowing out of Loch Ness. Notice Inverness Castle top right. It is a court house and former prison - built in the early 19th century - and now has a 360-degree viewpoint open to visitors right on top (though there is an admission charge). Population: c. 36,000 - making it the smallest of the seven cities. Historically speaking, a strategically important town on the edge of the Highlands that is very easily accessible by road and rail from Edinburgh and Glasgow. The ‘must see’ Stirling Castle plus the historic features of the Old Town immediately below are the main draws. Take these away and you have an ordinary Scottish town, sorry, city. On our last visit, on a dreich day in March 2018, the place looked quite tired, some of the cafes and eating places down at heel, and the usual amount of 'for rent/sale' signs in shops - though this characterizes 'high streets' in many places. Like any other everyday kind of place, there is the obligatory and anonymous very large shopping mall – the Thistle Centre, that could be anywhere in the UK. The main street of well-to-do Bridge of Allan to the north may be worth a browse and it’s easy to tour Highland edge places like The Trossachs from Stirling. The Wallace Monument is also popular. Ho-hum. The site of the Battle of Bannockburn – where Scotland won back almost four centuries of independence – is a pleasant enough green space in an otherwise undistinguished urban sprawl. It is historically significant and has a visitor centre, hugely extended and revamped in 2014. Alternatively, you could just make this small city a day excursion and visit the Castle. I wouldn’t blame you. This is a view of Stirling taken from the top of the Wallace Monument. You can just spot Stirling Castle in the centre of the photograph. (Pictured here) Perth by the River Tay. City Chambers left, with Perth Bridge by engineer John Smeaton, opened 1771, on right. Where were we? Oh yes, Perth used to be one of the cities in Scotland but lost the status because of an administrative oversight after a local government re-organisation in 1975. Fancy that! It stopped being one of the cities in Scotland because some harassed administrative official lost the paperwork! Anyway, it comes out so well in ‘quality of life’ surveys and has a proportionately high number of small businesses and shops, plus a pleasant ambience down by the River Tay: so I am especially delighted it has been added to the list of cities in Scotland once more. It hasn't really got a total 'must-see' attraction as such - though Scone Palace is fairly popular but it’s a good base for touring well-to-do Perthshire and well worth a look. What is the definition of a city in Scotland? Ask a Scot to list the cities in Scotland and they would start with Edinburgh and Glasgow, of course, then add Dundee and Aberdeen. Probably they would then remember some media story about Inverness and Stirling becoming cities in the 21st century. Then they would muse how a city is defined. Some say it’s a town with a cathedral – hence soccer team names like ‘Elgin City’ or ‘Brechin City’ belonging to comparatively small places but communities with ancient cathedrals. Gosh, it must be fun having the job of queen – though that all sounds a bit serious – but the granting of city status allows access to various sources of development and promotional funding, so it’s quite significant.